Which line suggests that the character called "the youth" was capable of understanding how this battle was like the rest of his life? A The youth thought of the village street at home before the arrival of the circus parade on a day in the spring. B As he caught sight of the them the youth was momentarily startled by a thought that perhaps his gun was not loaded. C Perspiration streamed down the youth's face, which was soiled like that of a weeping dirty child. D As he gazed around him the youth felt a flash of astonishment at the blue, pure sky and the sun gleamings on the trees and fields. Which definition best matches the use of the word piece in paragraph 13? Why does the youth in paragraphs 14-16 stop thinking about his own safety and begin feeling instead like a member of the team of his fellow soldiers? A In the heat of the battle he finds strength in surrendering himself to the unity of his regiment. B As he faces the charging enemy, he has to hide behind his fellow soldiers to avoid getting killed. C In the face of an attack, he desides to change his personality and act more like other soldiers. D As he realizes his weapn is not working, he has to ask his fellow soldiers to shoot for him. What is the effect of the story's point of view? 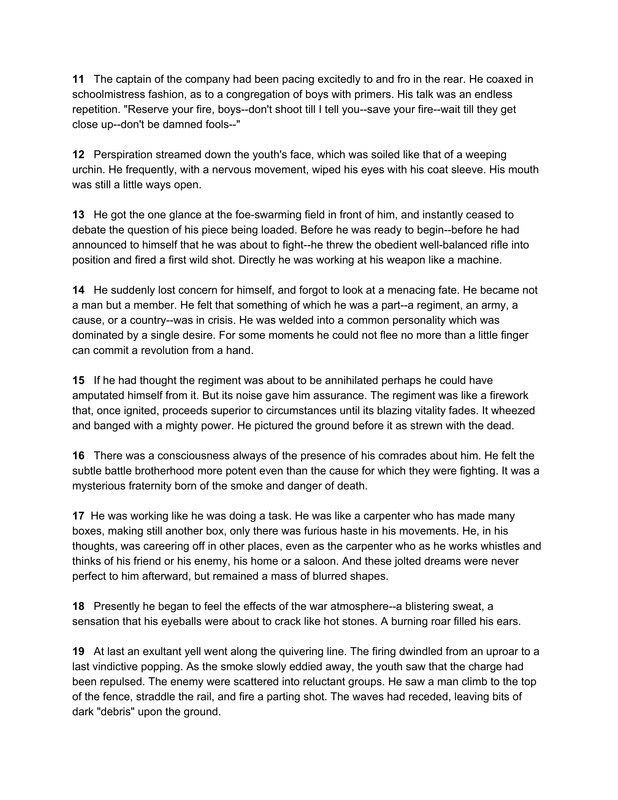 A By having the youth narrate the events of the battle in the first person, the author can better convey his thinking and the confusion of battle. B Although it is told in third person, the events are related from the viewpoint of a single soldier who is identified only as "the youth," so the reader feels like he or she is that soldier facing death. 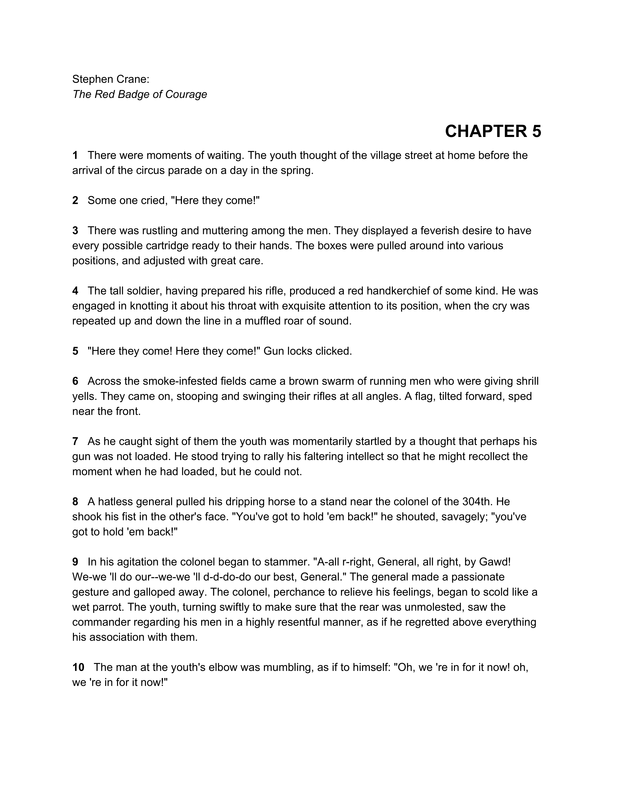 C By different participants in the battle telling their views of the events, the reader gains an understanding of what generals, lieutenants, and foot soldiers experienced as it occurred. D Although the youth tells his side of the story, the author uses a collective "we" to represent how the entire regiment felt as it banned together as one to repulse the enemy's frontal assault. 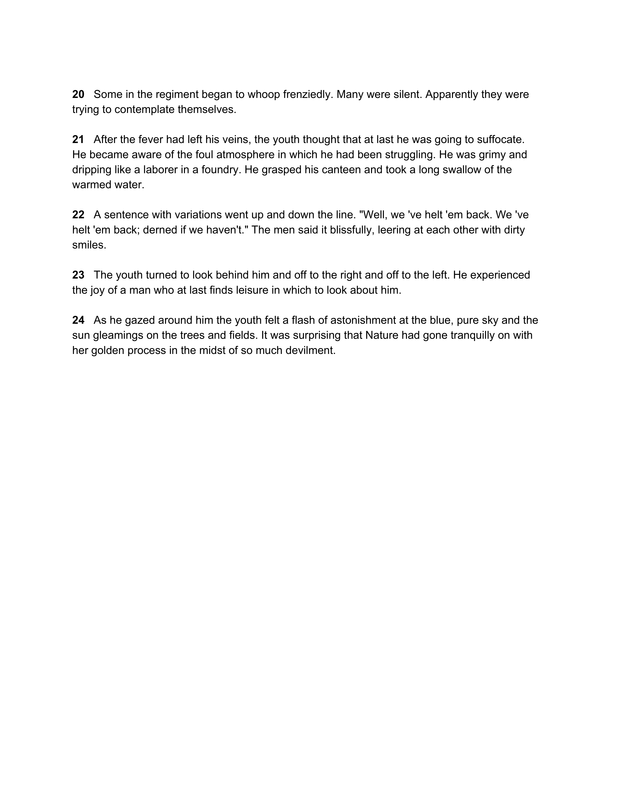 Read the following sentences from paragraphs 23 and 24. The youth turned to look behind him and off to the right and off to the left. He experienced the joy of a man who at last finds leisure in which to look about him. As he gazed around him the youth felt a flash of astonishment at the blue, pure sky and the sun gleamings on the trees and fields. It was surprising that Nature had gone tranquilly on with her golden process in the midst of so much devilment.